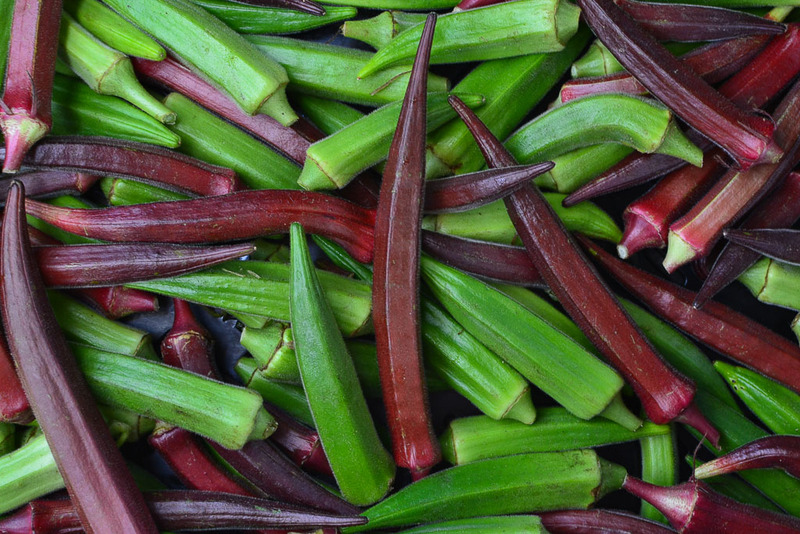 Okra is an annual sub-shrub closely related to cotton and hibiscus. 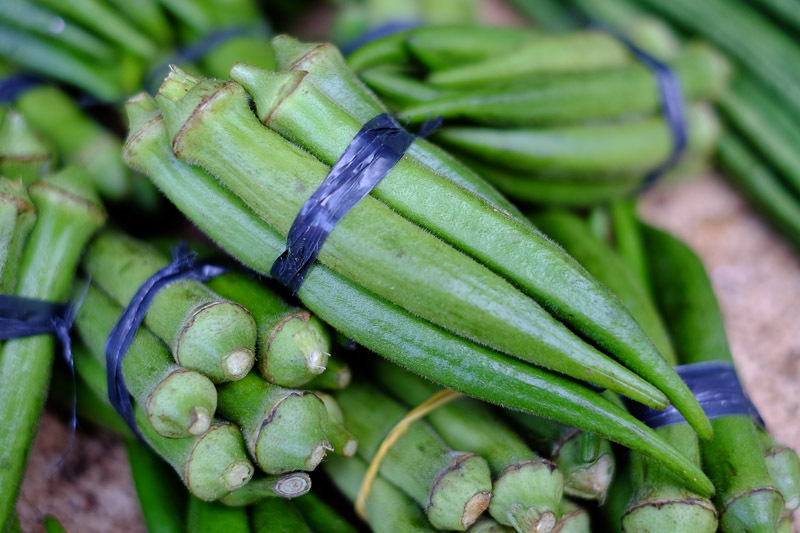 It originates from tropical Africa but is now widely cultivated in many countries for its immature seedpods, which are cooked and eaten as a vegetable. It typically grows 1 to 2 m (3 to 6 ft) tall with a single unbranched stem bearing large green, deeply lobed heart-shaped leaves. Flowers hibiscus-like with pale yellow petals and purple centres. These are followed by long, ribbed green seedpods, less commonly wine-red, becoming dry and brown when mature with several small round seed inside. The seedpods are harvested when young and when the tips can be easily pinched-off without resistance. They are steamed, boiled, fried, made into chips or pickled. In New Orleans, it is the central ingredient in Jambalaya, a Creole dish of okra, rice, freshwater crayfish and various meats. 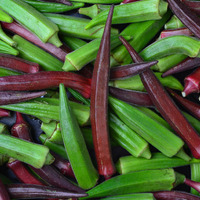 The immature seedpods are also used as a thickener in sauces, curries, soups and stews, including the famous Gumbo stews of Louisiana, in the southern United States. 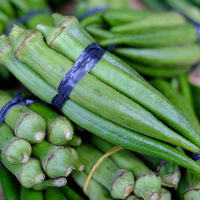 They are an essential ingredient in steamed seafood dishes in the West Indies and are found for sale as a fried chip or crisp snack food in India and Southeast Asia. The seed from seedpods left to mature and dry on the plant can be pressed to extract an edible oil, or can be ground into a flour that is rich in fibre, protein (around 22% of their dry weight) and fats. Seed oil content ranges from 15 to 22% of dry weight and the expressed oil is a greenish-yellow with an agreeable flavour and aroma. The mature seed also makes a good poultry feed. The stems with seedpods intact, as well as singular seedpods are sometimes dried for use in floral arrangements. The young seedpods are high in fibre as well as having good levels of Vitamin C (Ascorbic acid) and some Folate. Grows well as an annual in sub-humid to humid subtropical and tropical climates, generally in areas with annual lows of 10 to 25 °C, annual highs of 20 to 35 °C and annual rainfall of 700 to 3000 mm. The seed are best sown in spring to early summer in subtropical areas and toward the end of the rainy season in tropical areas (leading into the drier, cooler months), when there is sufficient soil moisture for good germination and growth. The planting site should have full to partial sun exposure and the soil in which the seed is sown should be a free-draining clay, loam or sand that has been enriched with organic matter and adjusted to have a moderately acid to neutral pH, generally in the 5.5 to 7.5 range. It is listed in one or more reference publications as having escaped cultivation and a weed of agriculture, but there does not appear to be any record of it as a serious weed anywhere in the world. The fine hairs on the stems and seedpods are an irritant for some people and may cause them dermatitis on contact. Winters, H. F & Miskimen, G. W. 1967, Vegetable gardening in the Caribbean area, U.S. Dept of Agriculture, Washington D.C.
Morton, J.F. 1964, Honeybee Plants of South Florida, Proceedings of the Florida State Horticultural Society, Vol 77:415-436.